Web Hosting by FatCow - Who's That Cow? What's with the FatCow Thing? 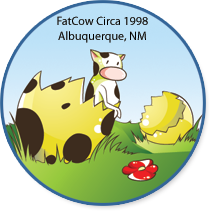 FatCow was born in 1998 and the rest is history. We've grown our company with a dedicated group of talented believers in the notion that simple, old fashioned service and value still ring true. FatCow has focused our entire company on delivering the best value and customer service experience in Web hosting to the small business user. We make every effort to make our services easy to own, easy to use and most importantly to provide real business value. And yes, we like to have fun doing it. Great Hosting Plans. No Bull. Just like our company, FatCow's Web hosting plan is a different breed. To simplify getting your personal or small business website up on the net, we created and pioneered a one plan one price philosophy. The FatCow Web hosting plan has everything you need to stake out your piece of the Internet, right out of the box. If a full hosting plan is a bit more than you're looking for, our MiniMoo plan might just fit the bill. We created MiniMoo as a way to get started on the Web with just a domain name and an email address to get the word out. You can post a generic under construction page until you're ready for a full hosting product, or you can use our Website Builder tool to build your own page. MiniMoo is perfect if you're just starting your business or need a placeholder for several domains. If you'd like a friendly voice to help select a Web hosting plan to meet your specific needs, our sales & service staff at 1-888-278-9780 is always here to help. Founded in 1998, FatCow is a provider of shared Web hosting solutions for small to medium-sized businesses and individuals looking for an affordable Web hosting option. For additional service information please review our Terms of Service, Acceptable Use and Privacy Statements.